The metro network in the city of Osaka, also known as the Osaka Municipal Subway, forms an integral part of the large scale transit system. It holds the distinction of being the only subway to be legally classified as a tramway when all the other systems in Japan are divisioned as railways. The Municipal Subway of Osaka accounts for almost 2.2 million daily passengers. The first service of this extensive transit system was started on 20th May 1933, between the Umeda and Shinsaibashi stations. The bustling city of Osaka has a complex network of transport system. With a good number of metro lines and stations, it can be a little difficult to find the right direction. 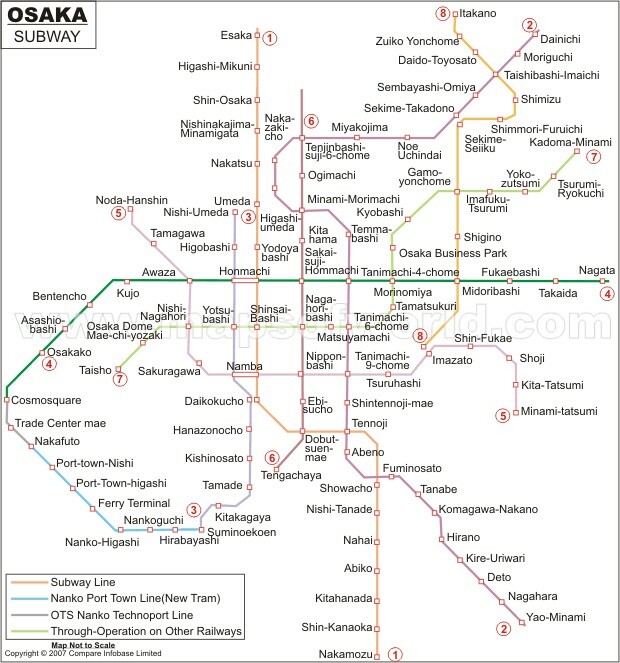 This map of Osaka Subway clearly depicts the metro route of the city. It points out all the major subway lines and stations that form a part of the Osaka Subway. The Nankō Port Town Line, also known as the New Tram, is also shown in the map. It was started in the year 1981 and serves mainly the inhabitants of the newly constructed Osaka South Port. At present, the Osaka Municipal Subway consists of eight subway lines, serving 123 stations across 129.9 kilometers. The Midōsuji Line is the busiest line in the entire network. Osaka Municipal Subway is the only system that uses third rail electric system for power.